For many decades, the lead-acid battery has been the most widely used energy-storage device for medium- and large-scale applications (approximately 100Wh and above). In recent years, the traditional, flooded design of the battery has begun to be replaced by an alternative design. This version - the valve-regulated lead-acid (VRLA) battery - requires no replenishment of the water content of the electrolyte solution, does not spill liquids, and can be used in any desired orientation. Since the VRLA battery operates in a somewhat different manner from its flooded counterpart, considerable technological development has been necessary to meet the exacting performance requirements of the full range of applications in which rechargeable batteries are used. The valve-regulated design is now well established in the industrial battery sector, and also appears set to be adopted widely for automotive duty. This book provides a comprehensive account of VRLA technology and its uses. In the future, all industrial processes - including the manufacture of batteries - will be required to conform to the conventions of sustainability. Accordingly, the crucial areas of the environmental impact associated with the production and use of VRLA batteries and the recycling of spent units are also treated thoroughly. 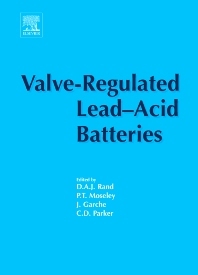 Valve-Regulated Lead-Acid Batteries gives an essential insight into the science that underlies the development and operation of VRLA batteries and is a comprehensive reference source for those involved in the practical use of the technology in key energy-storage applications.